Walking by the natural salt pan for about 350 mt you reach the sandy beach of Salina Bamba surrounded by typical vegetation and granitic rocks which create a magical atmosphere. Here a beach area where guests can rent a limited number of umbrellas and beds. 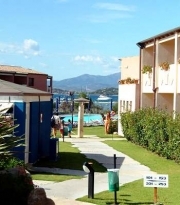 At about 4 km from the Hotel there is the holiday complex of Puntaldia, a very nice place with its exclusive tourist port and a 9-hole golf course. Baja Bianca Club Hotel is a new touristic resort. In the principal area of the Hotel are the main facilities: reception, hall, boutique/bazaar, relaxing area with television, restaurant and a large terrace with a sea view. Standard rooms and suites are both located at the ground and first floor, near the sea. Surrounded by gardens and typical flowers you can find two swimming pools, either for children and for adults, and a meeting point as “Piazzetta delle Ginestre” with the “Bar Bamba” where delicious drinks are friendly served until late. Near the natural salt pan and perfectly surrounded by mediterranean gardens is the amphitheatre, a very nice area for evening entertainments. For children a recreational open air area with playgrounds. Rooms: All equipped with TV SAT, phon, safe, mini-bar (extra charge), air conditioning (included) and private bathroom. Standard: Tastefully furnished, located on either the ground and first floor, with a large equipped patio or balcony. Twin-bedded or double room with 3°/4° bed in single or double sofa. Possible baby-cot in substitution of 3°/4° bed. Suite Suaraccia: Opposite to the main entrance, close to the sport facilities, can be on the same floor or with a loft. Upstairs loft with double bed and downstairs living-room with possibility of 3°/4° bed in single or double sofa. Baby-Cot as well as extra bed. Private bathroom and equipped patio with a small garden. bed in single or double sofa. Large possibility of baby-cot. Patio with a beautiful sea view. Communicating rooms: two standard rooms next to each other and communicating. Possibilities of 4,5,6 beds and baby-cot (reductions only for families).